Okay, okay, here’s the recipe. Jeez. I must say, it’s too good to not share. When there was a mountain apple tree outside the studio — Hawaiians call the fruit ʻōhiʻa ʻai (Eugenia malaccensis) — I made these pies every summer, one after another, so many that I froze them to eat later. One year I was too late, and I could only watch the bulbul birds eat the entire crop in 20 minutes. “Hey fellas, come on over: breakfast!” Another year afterwards, the fruit was just not edible anymore. I think the tree was just old, so we cut it down. This past Friday, I went to Candy’s house to catch a ride to our art show reception at 1132 Bishop Street in Honolulu. But first she pressed me into service to help pick the mountain apples from her tree for the refreshment table. Clearly, Candy and Ken have a harvest they cannot possibly eat by themselves alone, and I was overjoyed when they offered me the surplus. 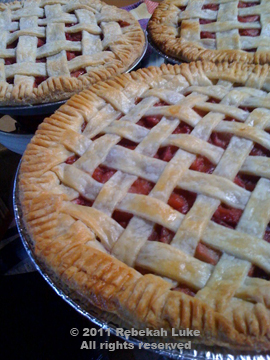 Thinking about our family potluck gathering the next day, I thought, I’ll make pie! This recipe has already been published in Everyone, Eat Slowly: The Chong Family Food Book (Kaaawa: Chong Hee Books, 1999). I adapted it from a formula a chef at the Kahala Hilton gave me many years ago when I worked for Sunset. For my recipe, the Betty Crocker brand mix is a must. Yesterday I used 15 very large mountain apples for one 9″ pie. I substituted 3 tablespoons fresh calamansi juice for the lemon juice, and I brushed the top with half-and-half cream for a golden brown finish. Gorgeous mountain apples, freshly picked and washed. The foreground shows the apples pitted, trimmed, and cut into chunks with a paring knife. 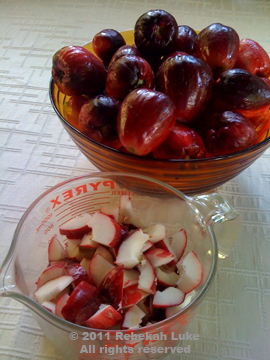 In Kaʻaʻawa the season for ʻōhiʻa-ʻai (mountain apples) is in June, usually, and it last for about two weeks. The challenge is to harvest them before the birds do. And then, what do you do with them? There are only so many fresh mountain apples one can eat. Now you can try them in a pie! The flavor is a cross between apple and rhubarb. Prepare Betty Crocker Pie Crust Mix for a double-crusted pie. Combine the mountain apples, salt, cinnamon, sugar, butter, and lemon juice. Cook until the mountain apples are half done, about 10 minutes in the microwave on full power. Remove from heat. Gradually stir in tapioca or flour. Cool mixture. (Place the mixture in its container in the freezer to cool down fast; be careful not to freeze). Pour into unbaked pie shell. Cut a vent in the top crust and place over pie. Seal the top crust to the bottom crust. Bake at 375 degrees Fahrenheit for 45 minutes. Remove from oven and cool before slicing. The filling sets as it cools. Ready to bake. 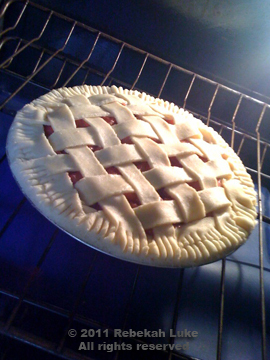 I decided to make a pretty lattice top like the picture on the box of the Betty Crocker Pie Crust Mix. Our mountain apples never turn solid red as in the photo. They have a lot of green left when they fall and really don’t taste quite ripe. The ones missed by the birds also don’t turn red. Our tree is about 35 years old. It looks old but has lots of new growth this year since we thinned it out. What do you think? Thank You, Great recipe the pie was so ono! I am so glad you found the recipe! I just made another pie last week too. Yum! It’s my hubby’s favorite. I like the way you made it vegan. The mountain apples are seasonal, and as their name suggests, you can find them in the mountains, or check farmer’s markets this month. If you know someone with a tree that’s bearing, that’s the best. I made this pie the other day and the whole family loved it. My boyfriend’s son said he is going to bring over more apples so I can make some more pies before his tree is pau. Thanks for posting it. I’ll definitely make it again next year.